As I was desperately in need of an enormous omelet the other day (with toast and tea and a sit-down experience), I walked down 34th to 8th Avenue and treated myself to a 3-egg Tick Tock Diner omelet. Sometimes only a diner will suffice. Afterward I checked out Famous Footwear and Kmart, both conveniently located down 34th Street from Tick Tock. Yes, I was looking for ballet flats at Famous Footwear, but didn't see any mind blowing black ballets. And I felt the pressure of the BOGO 1/2 off, as I felt pressured to find two pairs of shoes. A little disappointing, but I did spot a very cute new line for FF, Libby Edelman. On 34th Street and on sale for $49.99. Yes, that Edelman. Turns out she's Sam's wife and designing partner, and she has a new line of shoes exclusively available at Famous Footwear. They were the shoes I kept going back to, and really the most fun and interesting designs in store. I think I saw these in store, but I was in a bit of a post 3-egg omelet haze. On sale for $59.99. And I'm pretty sure all 3 of these were also on 34th Street...on sale for $44.99, $29.99, & $39.99. Tomorrow, Kmart juniors sale and a very cute, maybe favorite Kmart outfit, all on 34th Street and in near range of diner food. 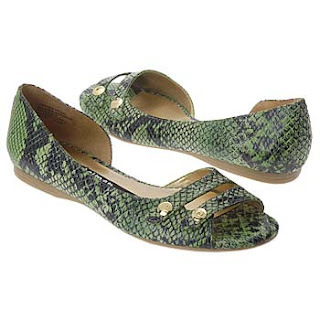 Wow, a snakeskin, peep-toe, d'Orsay flat. So many trends in one shoe! 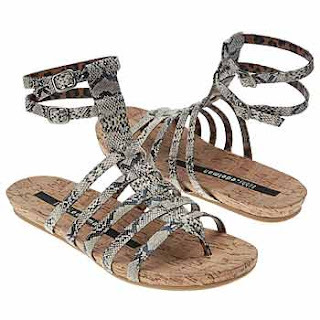 Hi there-I also like the snakeskin peep toe flats and the white high sandals, lovely picks my dear! Simply adorable! Those croc flats are making me DROOL. I am SO going shopping there....you rock! all i see are shoes. where's the omelet? Miss Yaya - i was in the mall yesterday, the stores look great but square one isn't ready yet - it should be open soon!